Zebras are odd-toed ungulates of the Equidae family native to eastern, southern and southwestern Africa. They are best known for their distinctive white and black stripes, which come in different patterns unique to each individual. In addition to their stripes, zebras have erect, Mohawk-like manes. 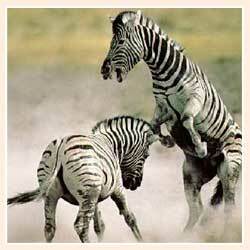 Zebras are generally 2.3 m long, stand 1.25-1.5 m at the shoulder, and weigh around 300 kg. Zebras are very adaptable grazers. They feed mainly on grasses but will also eat shrubs, herbs, twigs, leaves and bark. There are three species of zebra: the Plains Zebra, Grevy's Zebra and the Mountain Zebra. They can be found in a variety of habitats, such as grasslands, savannas, woodlands, thorny scrublands, mountains and coastal hills.